Life is a beach! Is it not? 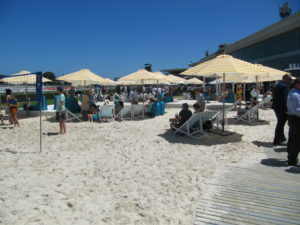 I suppose if horse racing doesn’t attract the punters because they are all at the beach, then bring the beach to the punters! I would have thought that if you are at the beach then the new technology makes it easy to have a bet and watch the race under your umbrella, with cold beers close at hand in the chilly bin. Why bother going to the track? Maybe it is just a gimmick for Australia Day. 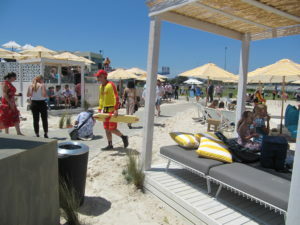 But it is reassuring to see that there are lifeguards with flotation devices in case anyone drowns in debt! 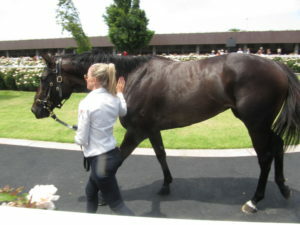 And in the two-year-old preview for males Auxin was the only colt holding on to his head in the mounting yard. I thought I had third place all wrapped up only to be lunged out of it on the line. So a third and a fourth for zero return! The only other thing of interest to report is the behaviour of the two-year-old filly Catch Me in the mounting yard. Throwing the jockey off, was it twice or three times? The horse then went out and won convincingly. I would normally lay these types of horses except my stats advise caution! In Watching More Racehorses I point out an apparent anomaly where Airborne Jockey has a positive behavioural handicap of 54%! The sample size is small, but I have seen 64 flying jockeys with 9 improbable winners. Those stats now become 10 out of 65, or a strike rate of 15.4%! Clearly I should back and not lay. And another thing. What the hell is VOP? The course broadcaster kept banging on about it until I was forced to ask Siri. Apparently it is a new system that replaces the old bookies starting price. Known as the Victorian Official Price it is sourced from the prices of high turnover Australian Wagering Service Providers as opposed to oncourse bookmakers in Victoria. I guess that means the corporates in Darwin. And I guess that the old SP system has been ditched anyway as not many bookies bother to show up on course these days! And a Happy New Year to all horsewatchers! I got there early for the two-year-olds and it was a hotbed of testosterone. Five colts, and it seemed like all of them were calling out, rearing up, and flopping huge erections around. Amid all the chaos there was one filly calmly ignoring the carry-on, Pretty Brazen, with a nice positive strapper. I went for it at $1.90 on the tote, only to see it tumble into $1.70 the place. Obviously I wasn’t the only one to be impressed. The filly had it won, only to be nailed in the shadows of the post. I didn’t have another bet until Manolo Blahniq in the last race, a typical horsewatcher’s head-down horse, and a nice $2.20. So between the first and last I tried to work out a new strategy for watching horses at Flemington. My refuge, the Island Bar, is no more. Its replacement, the Members Bar, has been kicked upstairs to the first floor of the Club Stand. Too hard for me to wander in from the yard. I don’t want to climb stairs. 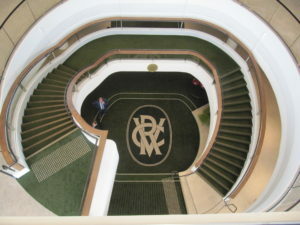 But there is a walkway to the horse stalls on the first floor, so maybe that’s an option, but I discover there is no way to get down to the stalls once you get there, you can just look down from above. What is the point in that!? 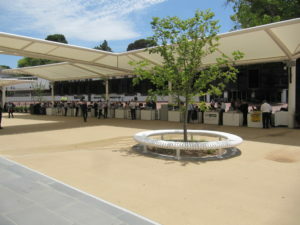 There is the Paddock Bar near the yard, but it is open and exposed to the south-westerly wind, and there are no tote operators, just a few machines. I do like a cash bet now and then and handling the folding money. So much better than a change in the balance on your phone. The bookies ring is deserted and I don’t bet with them. But there are a handful of tote windows out there. So I guess it’s the Paddock Bar and then out to the tote near the bookies. 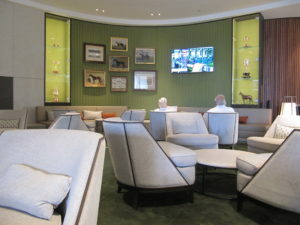 The entrance to the Club Stand is like the foyer of a five star hotel with comfortable lounge chairs and a screen for the races flanked by racing memorabilia, but no screens with odds. I suppose this is where I will end up watching the races. I could even fall asleep here! Do you think horse racing is dying? All the horse bookshops that used to sell my book have closed down – the Horseman’s Bookshop in Melbourne and Sydney, Mitty’s in Melbourne, the High Stakes Bookshop in London, the Gamblers Bookshop in Las Vegas. My book distributor, Dennis Jones, has gone into liquidation owing me about $1000. My IT advisor says this is all “the sad state of dead tree publishing”. He also says long form blogs are going the same way and that I should move to Twitter or Instagram. Twitter? Whoever would want to share a platform with Donald Trump? So, I’m thinking, I should probably stop flogging a dead horse. Maybe this blog should become shorter and less frequent. And maybe just fire up for the spring!